The Mellinger's dream of living off-grid in Montana came to fruition in 2015 with the completion of their new construction home outside of Dillon, MT. 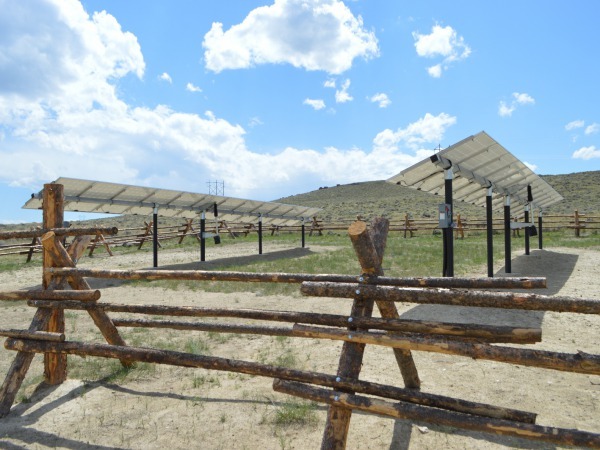 OnSite Energy was contracted to design and install their off-grid solar electric system with a goal of high reliability, minimal generator run time, and low impact on the expansive panoramic views. The result is a system design and integration that fits well into the property while providing the homeowners with a robust self sufficient power system that will provide clean renewable energy for many years to come...free from the restrictions of the utility grid. A critical aspect to off-grid system design is to estimate the energy usage of the home as accurately as possible. For new construction projects, this can be a challenging task. OnSite Energy worked closely with the homeowners and their construction team over a period of several months to estimate the energy consumption of the home. The energy consumption estimate became the foundation for sizing and designing the battery bank, solar array, and power system. Location and aesthetics of the solar array was also an important factor in the system design, which led to a low profile racking system at a location that would avoid impact on the view shed. As with most remote new construction projects, a generator is often required to run power tools and equipment to build the house. 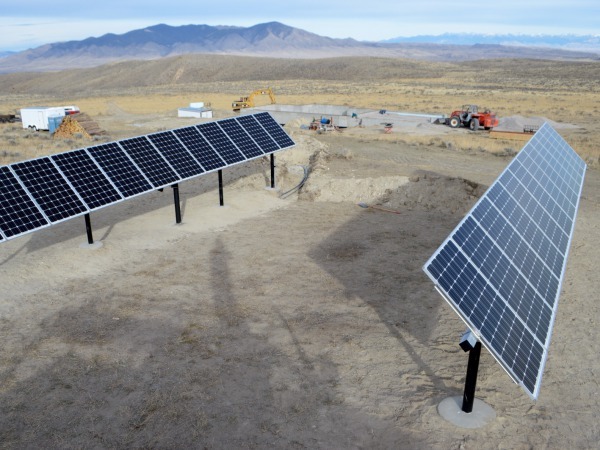 It was a goal early on in the project to get the solar power system operational as soon as possible in order to avoid the need for a noisy and expensive gas generator to power the job site. The solar power system was commissioned and online with another six months of construction scheduled, which was a relief to all those on the job site. 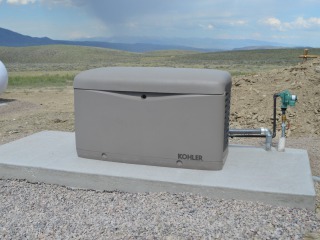 The system has now been operational for almost a year...with no issues...and no utility bills! For off-grid homes, maximizing the energy yield of the solar array is critical to the overall system operation and reliability. By adjusting the tilt angle of the solar array on a seasonal basis, the angle of incidence can better match that of the sun, which in turn produces more power. 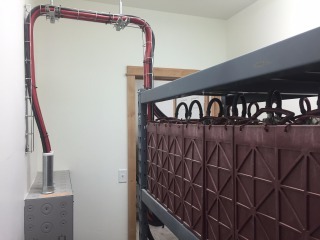 Many racking systems have cumbersome and somewhat dangerous tilt angle adjustments. By utilizing a single axis tracking rack facing south, the tilt angle of the solar array is easily accomplished with a cordless drill. 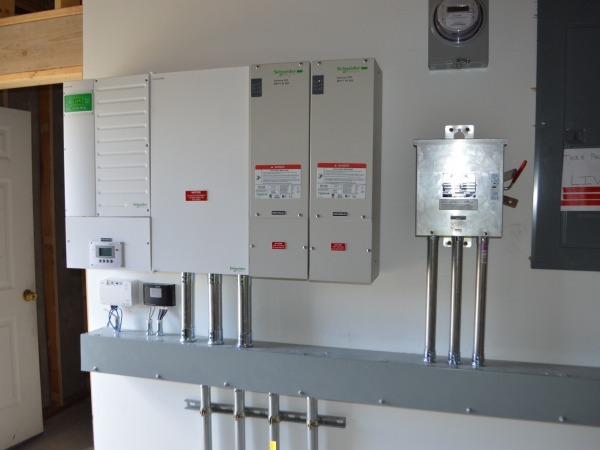 "Throughout design, installation and on-going system operation, OnSite Energy has been an excellent team to work with. They are very knowledgeable and responsive. Because of our remote location it was more economical to go with an off-grid solar system but it was also imperative that it be comprehensive. OnSite Energy clearly communicated the expectations for the various design elements of the system and they were flexible when changes needed incorporated due to unforeseen house construction issues. The system was fully installed and operational about six months into construction and provided power for all remaining construction. Based on the data collected during the first four months of living in our off-grid home, the system is operating as planned. We could not be more pleased with our entire experience as OnSite Energy customers."